All G-Shock watches are waterproof. 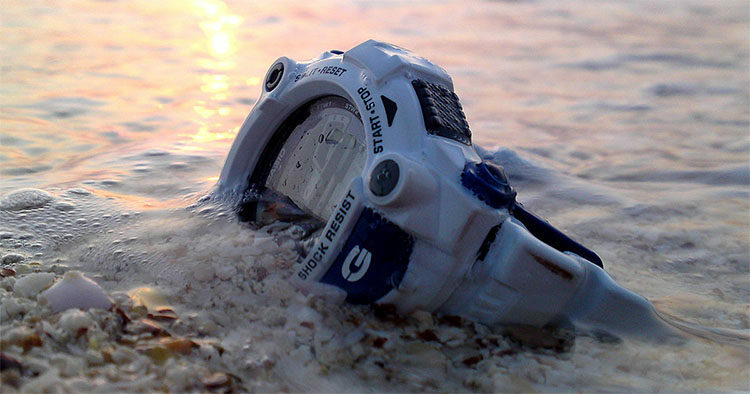 To be precise, all G-Shocks are water resistant up to a depth of 200m (660ft). Side note: As a recreational diver, you won’t go deeper than ~70m. In fact, most of the diving instructors I know dive with a G-Shock strapped right next to their dive computer. It’s a backup in case the computer fails. And it’s not the “diver” Frogman either – mostly the cheap models that they’re not afraid to bang around. Let’s take a closer look at how the G-Shock “water resistance” works. Waterproof means impervious to water – like a piece of rubber, for example. Water resistant means able to resist the penetration of water to some degree – but not 100%. The deeper you go, the more water pressure there is in the water. To explain it in other words, all the water that’s above is pushing down on the water that’s below. The deeper you go, the more water you have pushing down on you. And since you’re diving with your G-Shock, all that water pressure is also pushing down on the case of the watch. Which is why the case of the watch needs to be tough. Only professional dive watches have the 200m water resistance. Suitable for all high impact water sports and scuba diving at depths not requiring helium gas. At these depths, it is recommended to purchase a professional watch. Be careful when changing the battery on your G-Shock. If you don’t seal the caseback correctly, it will lose its waterproofness. If you’re in doubt, let a professional do it for you. Can You Press G-Shock Buttons Underwater? It’s safe to press G-Shock buttons underwater, as you won’t be going anywhere near the maximum depth range. The watch is made to withstand that kind of pressure. What Is The Meaning Of WR20Bar on a G-Shock? WR20bar means that the G-Shock is resistant to water under pressure up to 20 bar. Bar is a metric unit of pressure that equals to 10m or 33ft in depth. Are Baby G Models Waterproof? While all G-Shocks are water resistant to 200m, Baby-G watches will only resist 100m. No worries – that’s still enough water resistance for diving, even though it is only 50% of a G-Shock.